It holds one photo sized 4.5cms x 7cms which you insert at the back. 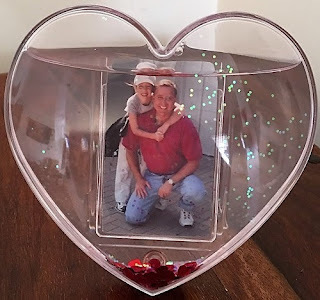 It has a plastic easel stand at the back to make the heart photoglobe stand. Photoglobe is made of a thick hard plastic so it is kid friendly. And comes in a box so is perfect for gift-giving. Click on the image above or click here and make a personal treasure to keep or to give to special friends and family anytime of the year.